The Hoplites were the warriors of Ancient Greece. The command pack contains 4 figures. Spears need to be bought seperately, pack NSS102 the most suitable. 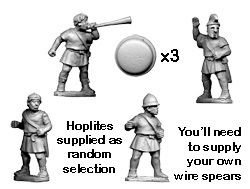 We also stock shield transfers for these Hoplites to save you the trouble painting each individual shield. Visit the Modelling and Accessories page for pictures and ordering details.